A major cause of issues within leaded and stained glazing in churches and historic buildings is the use of ferrous metal when used to make supporting saddle/ferramenta bars or opening window casements. In this example at St. Cuthbert’s Church, Over Kellet, Cumbria, the terrible condition of the “hopper” casement is quite clear to see. Corrosion of the ferrous metal will often have rendered these type of units unoperational for many decades but it can also cause considerable (and often very costly) structural defects in both the glass and its surrounding stone setting. Where metal rusts and swells within or next to the channels or sockets within surrounding stone-work this stone can often can “blow” or crack and panels of leaded or stained glass bow or buckle causing the fragile glass within to crack. When originally installed (and whilst operational), these opening windows would have provided the necessary means to allow much needed ventilation into the building; a major factor in preventing/combating damp. As such, it is more often than not recommended that openers are either refurbished if condition allows, or replaced with new if not. On occasion, as in this instance, a client will seek permission to have a unit or units removed and replaced with fixed glazing on the basis the building has sufficient means of ventilation from other sources. In the case of churches and listed buildings formal permission should always be obtained prior to any such works commencing. 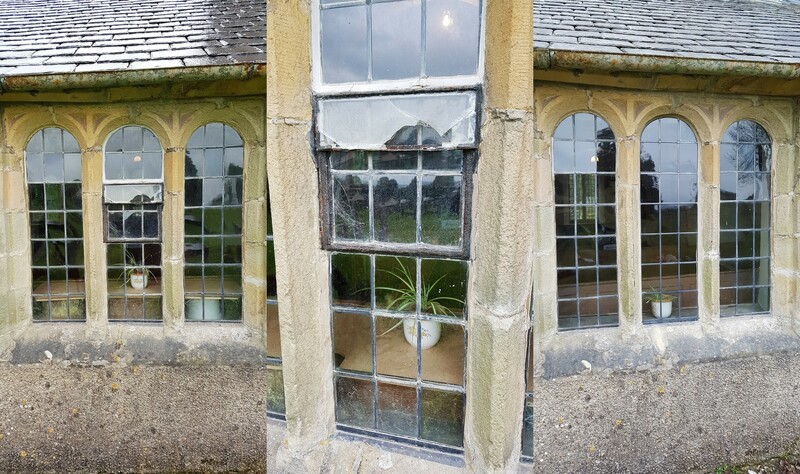 Our works on this project included the careful removal of 4 badly corroded and un-operational hopper casements along with the leaded lights above and below each. All intact glass was retained and re-used within new panels of “fixed” leaded lights. The earliest surviving parts of St. Cuthbert’s dates back to around 1200 however most of the building that stands today is 16th Century. Having found a small engraving on one of the cylinder glass quarries we removed from the north aisle glazing, we know the leaded glass on which we worked was originally produced by a “W Hill” in 1817. Our composite image shows one of the triple light north aisle windows prior to starting work, a close up of the badly failed opening hopper casement and the fixed lead-light glazing introduced following its removal.